Cosmetic acupuncture for facial rejuvenation is an amazing procedure that has been used in many parts of Asia to naturally lift and revitalize the skin for centuries. In fact, facial rejuvenation acupuncture, also known as cosmetic acupuncture, has a recorded history going as far back as China’s Sung Dynasty (960AD – 1270AD), when the Empress and the Emperor’s concubines used it to engender beauty and good health. Hormonal imbalances, hyper-pigmentation, and scarring from acne are some of the issues that can be addressed by this technique. Cosmetic acupuncture for facial rejuvenation, also known as Facial Acupuncture, can naturally enhance blood circulation, improve muscle tone, increase collagen production, tighten pores, and increase oxygenation of the skin without harmful side effects. 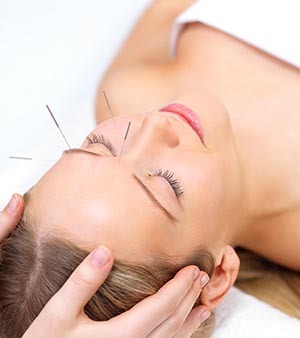 Moreover, when acupuncture is used to create overall balance within the body, the physical, mental and emotional patterns that contribute to aging are addressed, helping you look and feel younger. In today’s world we can age beautifully and gracefully without going ‘under the knife’. Of all the many beautification procedures available today, cosmetic acupuncture for facial rejuvenation is able to meet your beauty needs right here in our Santa Monica office. Cosmetic Acupuncture may take 5-10 years off your face and since it also addresses the imbalance of your energy, which at times causes early aging and numerous skin disorders, you will feel better inside too. How many visits do I need to see the visible change? The recommended facial treatment consists of 5-10 sessions in our Santa Monica office, with one or two treatments per week for the best results. Each individual will respond differently to the treatment, depending on age, diet and lifestyle. Visible results will be noticeable after 3-4 sessions. Schedule your Anti-Aging treatment with Dr. Hoon today!